CAPE CANAVERAL, Florida (AP) ― NASA’s robotic moon explorer, LADEE, is no more. Flight controllers confirmed that the orbiting spacecraft crashed into the back side of the moon as planned, just three days after surviving a full lunar eclipse, something it was never designed to do. Researchers believe LADEE likely vaporized upon contact because of its extreme orbiting speed, possibly smacking into a mountain or side of a crater. No debris would have been left behind. “It’s bound to make a dent,” project scientist Rick Elphic predicted. By Friday, the spacecraft had been skimming the lunar surface at an incredibly low altitude. Its orbit had been lowered on purpose last week to ensure a crash by Monday following an extraordinarily successful science mission. LADEE ― short for Lunar Atmosphere and Dust Environment Explorer ― was launched in September from Virginia. It completed its primary 100-day science mission last month and was on overtime. The extension had LADEE flying during Tuesday morning’s lunar eclipse; its instruments were not designed to endure such prolonged darkness and cold. But the small spacecraft survived ― it’s about the size of a vending machine ― with just a couple pressure sensors acting up. The mood in the control center at NASA’s Ames Research Center in Mountain View, California, was upbeat, according to project manager Butler Hine. “Having flown through the eclipse and survived, the team is actually feeling very good,” Hine told the Associated Press in a phone interview. But he uncertainty of the timing of LADEE’s demise had the flight controllers “on edge,” he said. “Each orbit could be the last one and you don’t know. It’s kind of a crapshoot,” Hine said. As it turns out, LADEE succumbed within several hours of Hine’s comments. The obituary announcement came early Friday morning, Eastern Time. 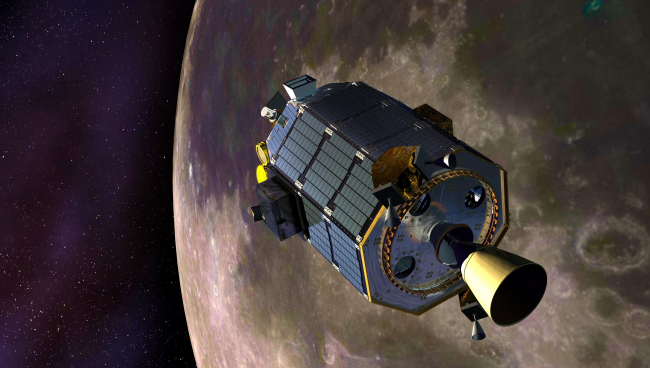 LADEE did not have enough fuel to remain in lunar orbit beyond mission’s end and keep collecting science. So from the outset, NASA planned to crash the spacecraft into the back side of the moon, far from the Apollo artifacts left behind during the moonwalking days of 1969 to 1972. During its $280 million mission, LADEE identified various components of the thin lunar atmosphere ― neon, magnesium and titanium, among others ― and studied the dusty veil surrounding the moon, created by all the surface particles kicked up by impacting micrometeorites.